Skipping Kuala Lumpur I headed south from Klang. 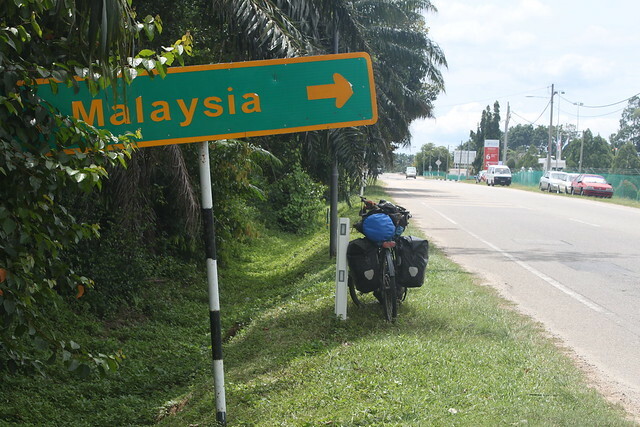 It was the same old west coast Malaysian cycling – busy roads and uninspiring scenery. A few dragon fruit farms spiced up the roadside activity but as quickly as they’d appeared they faded back into endless palm oil plantations. I remember being excited when I saw my first palm plantations back in Myanmar. I had no idea what a monotonous bore they’d become. Usually the big trees block any views from the road but as the hills stretched out towards Port Dickson it was possible to see how vast the plantations were. 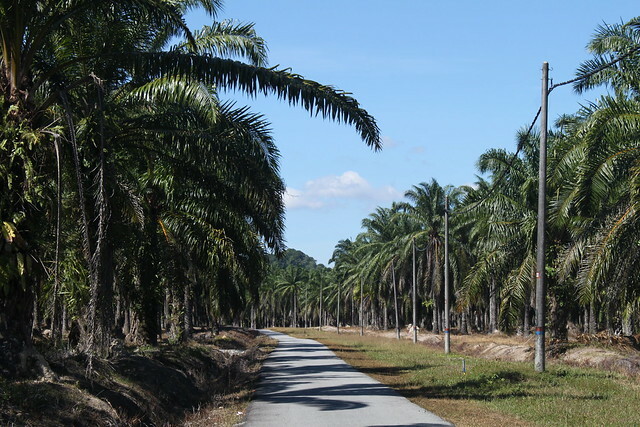 It’s easy to see why the environmentalists are so concerned about palm cultivation – God knows how many thousand hectares of jungle have been wiped out in this part of the world for the plantations. The worst part is that I will still be seeing them for many weeks to come. 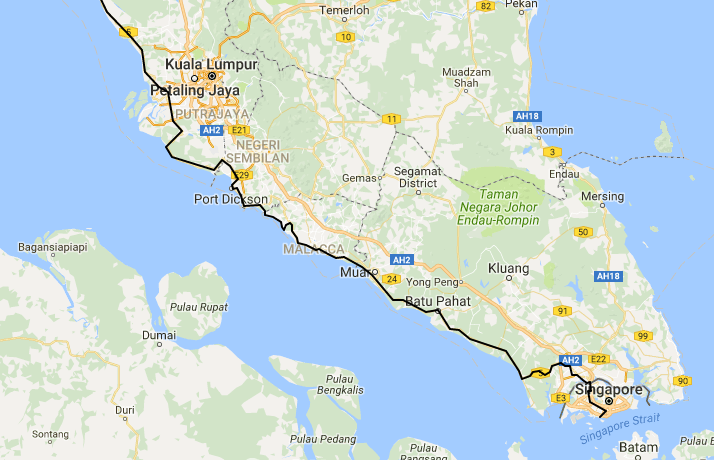 I’d miscalculated the distance and ended up riding 120km to Port Dickson. I couldn’t make it by dark and as evening fell a huge thunderstorm caught me on the way into town. Luckily I’d found a Couchsurfing host just out of town to spare me camping in the torrential rain! Thought I already was in Malaysia? I followed minor roads along the coast until I inadvertently cycled into a military compound. The soldiers shooed me away and I was forced to pedal all the way back to the main road. At the rejoining junction I saw two cyclists pass who I quickly caught up with. They were a Brazilian couple who’d been cycling around SE Asia for the last few months. We talked about how few cyclists we’d seen in this part of the world. They listed some of the people they’d come across and one was an English guy who’d cycled all the way over from the UK. I asked what his name was but they didn’t know. Who was this bloke cramping my style? Actually, I’d asked because I was surprised I didn’t know who it was. The long distance cycle community is pretty close-knit, especially within the trans-continental Silk Road tourers. I’d probably have heard of another nearby Englishman riding the same route for so long. Suddenly something felt familiar about the Brazilians as they described their route. When I’d been in the bike shop in Chiang Mai (north Thailand) I’d met a German guy while I waited for another pair of foreigners to finish their repairs. He told me they were Brazilians and that by chance they’d met on the train coming up from Bangkok. My it’s a small world…. We’d only met briefly and not actually spoken. Guess who that English guy was they’d just been telling me about? Yep – me! We stopped to watch the crew try and manoeuvre this ginormous machine around a wide bend. 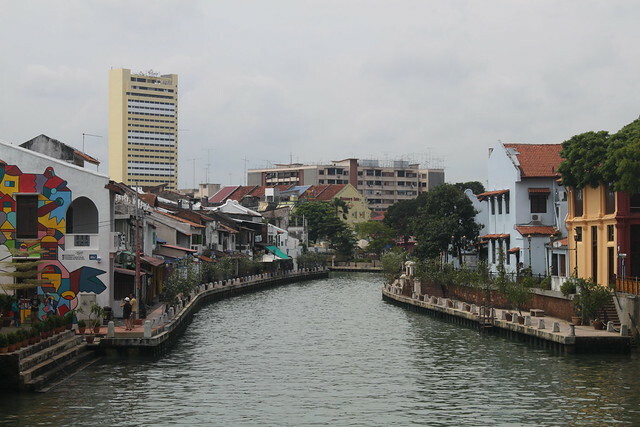 The tourists were back in Malacca – a really charming town. I stayed at Howard’s guesthouse, a bicycle enthusiast who lets cyclists camp out on the roof via Warmshowers. The place was closed for renovations so I even got a room! 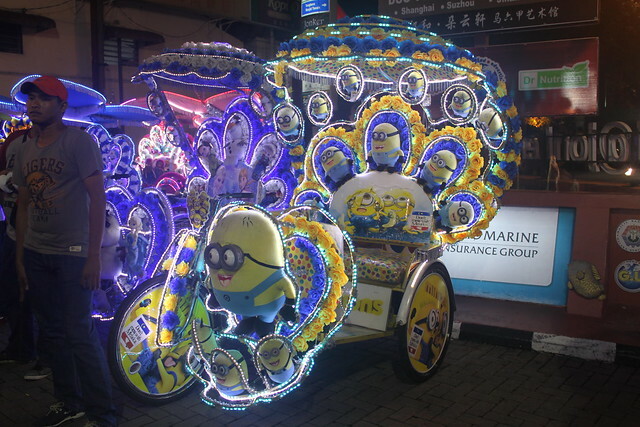 Malacca’s ‘China Town’ was a nice stroll, but as much as the historic sights were interesting – the highlight for me was the crazy rickshaws decorated in the most absurd fashion. 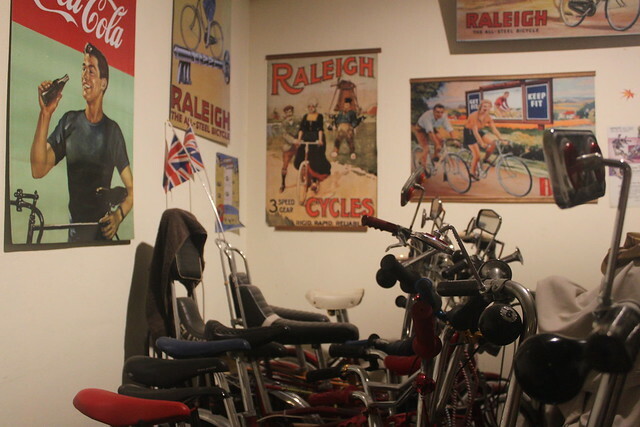 I visited another bike shop to see if they had a front gear shifter to replace my broken one. They didn’t, but the savvy blokes managed to fiddle things to a point that I now have 2/3 of my gears working rather than just 1/3. 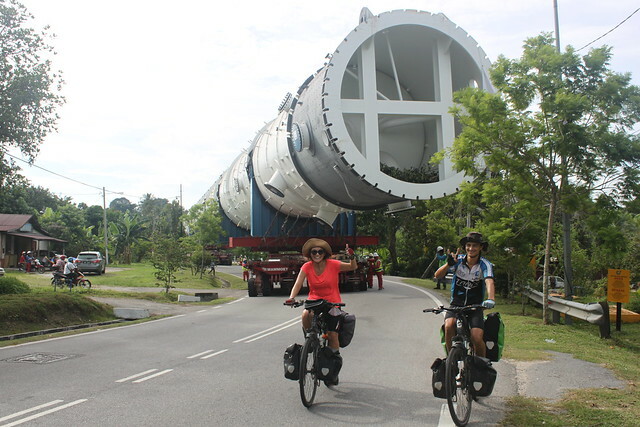 I was very happy to be cycling out of Malacca with so many cogs available – what a rare treat! In Batu Pahat I stayed with a couple of photographers who let me sleep in their studio. 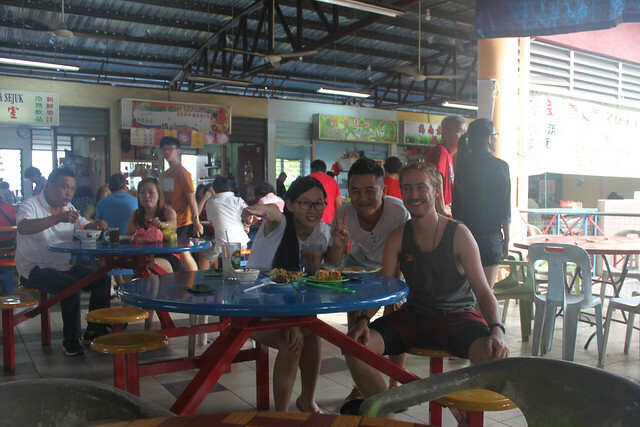 For breakfast we headed out to the local Chinese hawker centre. In many ways the different ethnic communities really stick to themselves in Malaysia. In this market all the food stall signs were in Mandarin so a Malay wouldn’t even be able to read them! But then again, they wouldn’t even come in here as the kitchens serve pork. I like being back amongst the Chinese community. It feels familiar somehow after the many months I spent in China and yet very different too. 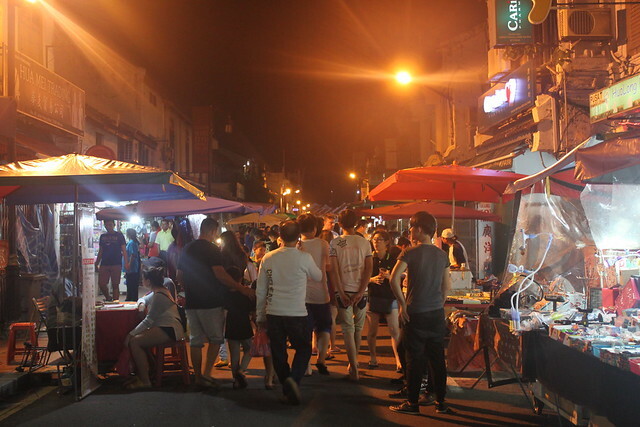 It’s like a better version of China – no rudeness, everyone speaks English, no spitting, people smile etc. Most of the Chinese here are from the south east of China so the food is a pretty different experience for me. I remember more Mandarin than I’ve learnt Malay and although it’s never necessary (they all speak OK English) I still like surprising the Chinese shop workers with a bit of basic Mandarin. And that’s just one of the groups! If Mandarin unifies the Chinese community, Malay joins everyone in Malaysia. But not all the Chinese or Indians are great in Malay (in places where they keep to themselves or those who’ve only just moved over) so sometimes English is the mutual language, making my life far easier. 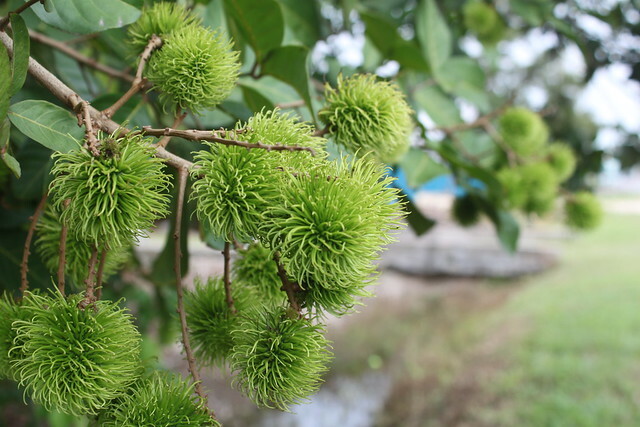 The roads were lined with rambutan trees – my favourite fruit in South East Asia. Not quite ripe yet though! The level of English in Malaysia is amazing. The highest standard I’ve experienced since I was in Europe. As a result I’ve had many interesting conversations with such random people, from the Pakistani road worker here on a two year contract to the ex-Malay navy officer who told me the jobs of each of his ten children. Being able to communicate with people really adds to my experience of a country. 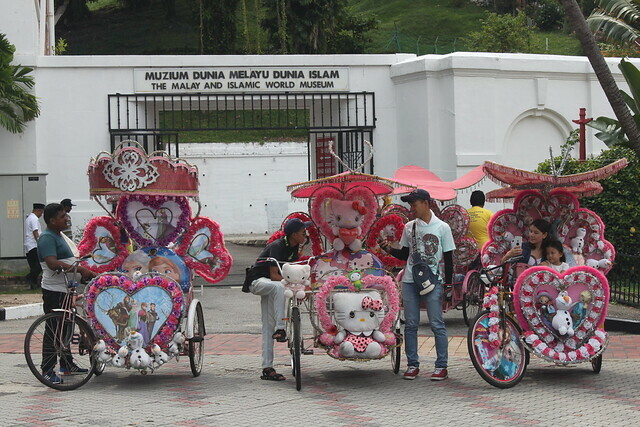 In a way, Malaysia is a wonderful example of how different cultures can live side by side in peace. On the other hand it’s strange to see people living so separate. 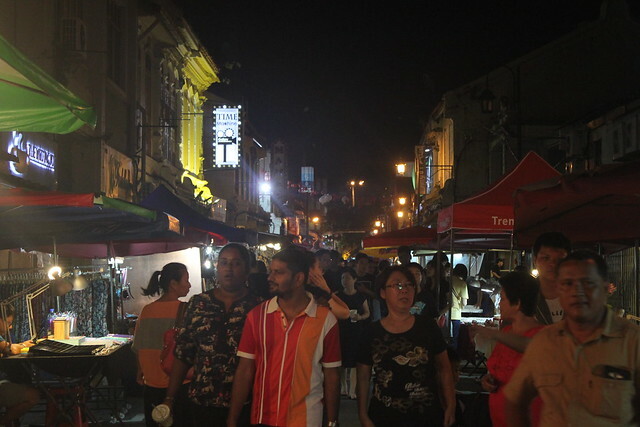 Families often keep to their own and sections of towns will be ‘Little India’ or ‘China town’. I’ve tried comparing it to England but it’s hard. I know there are plenty of communities in London where foreign groups keep to themselves, but often these are important cultural centres for people living in a different country. (My mum used to drag me to the Danish Church in North London every weekend when I was young). The 2nd/3rd generation Africans & Asians I grew up with were as integrated in everything as I was. Even if their family homes were a bit more ‘colourful’ than mine, it was never more than keeping hold of an identity and never stopped anyone cross-mingling. 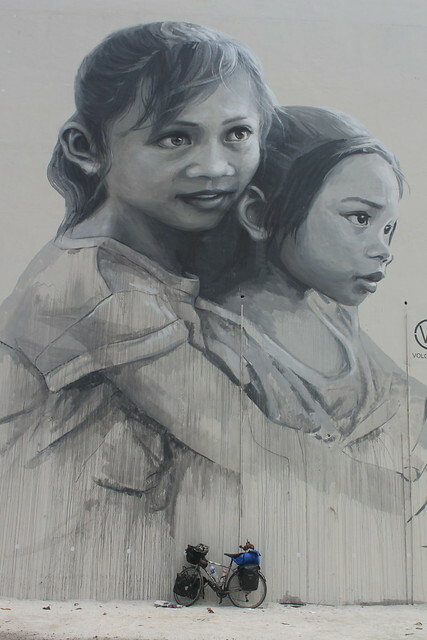 Malaysia’s largest portrait mural in Muar, completed three days before I arrived by a Russian artist. 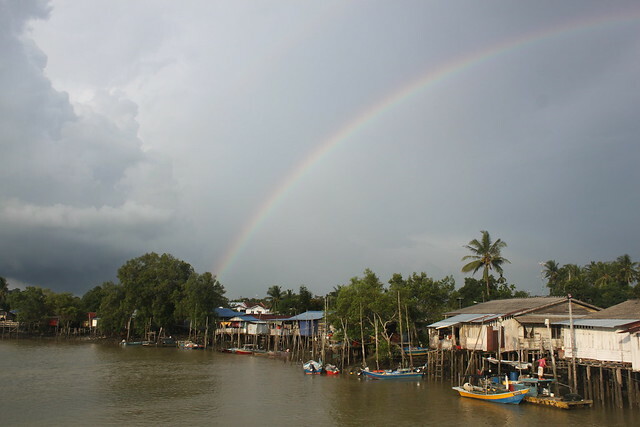 I stayed with 10 people via Couchsurfing & Warmshowers in Malaysia. 7 out of them were Chinese (interesting considering Chinese make up only a quarter of the population) and so I picked up a rather Chinese slant on Malaysian zeitgeist. What surprised me was how discriminated they felt. I was frequently told stories about how it’s harder for them to get into university, or how they can’t a mortgage as easily as a Malay. Many of the Chinese here have been around for generations and generations. Just because they are not indigenous to the country doesn’t mean they should be discriminated by the Malay government. If true – that’s very different to how things work in England. Yes, people sometimes abuse the benefit system but once you’re in you should be treated the same as everyone else inside. The Malays are Muslim by default. There’s nothing they can do about that. If I want to marry a Malay girl here, I have to convert to Islam. She can not denounce her faith and to me that’s crazy. I wouldn’t mind signing the ‘happily converted’ form, but I’d have to choose a Muslim name and get circumcised too! (Although that might depend on the area/imam). Women aren’t forced to wear the hijab (although most do), but Malays can’t eat pork or drink alcohol. It’s not just frowned upon – it’s illegal. There are plenty of Malays that aren’t Muslim and religion should not be opposed upon people. (This all feels very familiar from my writing about Iran, doesn’t it?). Here’s a crazy story: One of the girls I stayed with in Klang was working in Genting casino (the only casino in Malaysia). Muslims aren’t allowed inside as they’re forbidden to gamble. A Chinese guy who’d married a Malay (and so converted to Islam) was gambling inside. No one questioned him because he was Chinese and they are allowed to gamble. He won 6,000RMB. When he went to collect his winnings he had to produce his ID card and he pinged up on the system as ‘Muslim’. Not only did he not receive his winnings, but the police were called and he ended up in a world of trouble for breaking Islamic law. Mad! I eventually reach Johor Bahru, the last city across the border from Singapore. Singapore would damage my wallet but Malaysia had been an incredibly cheap three weeks. I’d only paid for accommodation in one place (out of choice). A huge number of people from Johor Bahru work in Singapore. They have to deal with a hellish commute but once on the other side they’ll earn about three times as much. It’s durian season but the fruit is expensive. 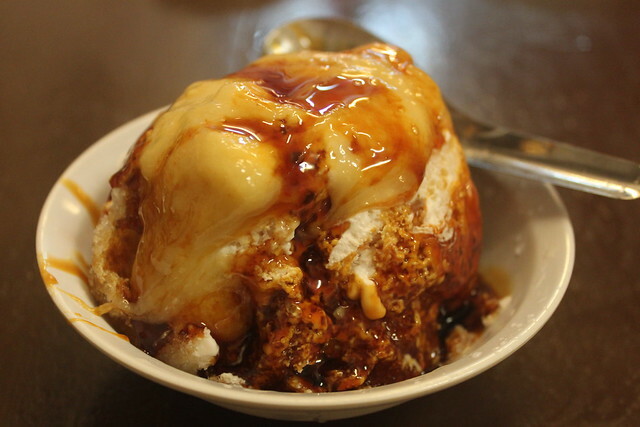 Cheapest way to give it a try is with ‘cendol’ – an icy desert. Would probably taste nice with the durian…. A lof the Malaysians have a degree of jealousy towards their big little brother next door. They say ‘look how quickly Singapore has developed compared to us, even though we have far greater resources’. Malaysia is far more developed than anywhere I’ve been in a long time but it still has plenty of ‘developing country’ problems. Corruption being one of them. It’s still the kind of place where you can usually slip the policeman a small note if he pulls you over for speeding. It’s more serious sometimes. One guy told me a story about one of his friends who was pulled over and asked for money by the police. They threatened to plant heroin on him if he didn’t cough up. The victim was actually well connected in his hometown and managed to get some publicity over the event and eventually get his money back and the corrupt officers locked up in jail. But enough chat. 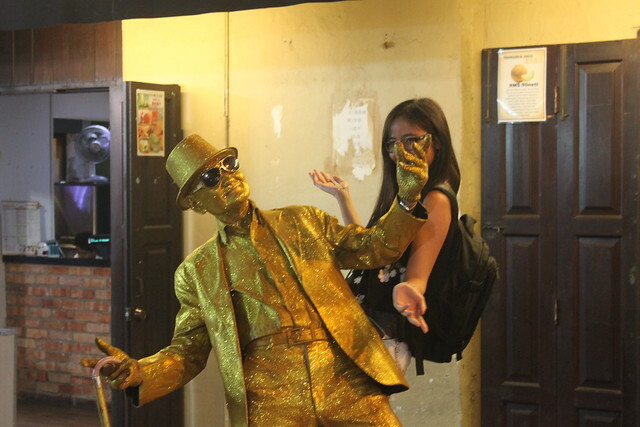 Thanks Malaysia – you’ve been bags of fun. Time to stock up on groceries before the expensive bubble that is Singapore!